I like Holiday Inn, because the chain always offers both good rates and comfortable rooms, and this isn't always on offer when traveling to London. 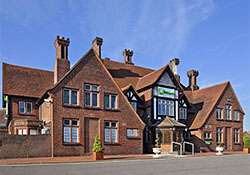 The Holiday Inn, Bexley, is a classic looking English hotel that offers great value for the money. While a little out of the way for Central London sights, the value is there and transport is easy. Not a location for the party animal, but if you're looking to get a relaxing stay, this might be a better option for most. In fact, there are many former guests of the Bexley who report how the staff is both energetic and genuinely pleased to welcome guests from both the U.K. and abroad in this outstanding classic 1930’s red-brick building that contains a very modern and hospitable hotel. Another aspect of spending your London holiday at the Bexley is the hotel’s Southeast London location and reasonable pricing for not only very clean and spacious rooms but an award winning breakfast as well. For instance, guests report enjoying the classic full English breakfast or munching from the hotel’s classic breakfast buffet while children under the age of 13 eat for free. All rooms feature wireless Internet access so you can stay connected while also enjoying premium television channels. There are also many free conveniences offered at this hotel that prides itself in top service that’s a British tradition. For example, most rooms include a coffee and tea maker, private bathrooms with hair dryers, climate control, a sofa bed and direct-dial phone. There are smoking and non-smoking rooms offered. In addition, many guests have raved about the relaxed feeling and great food offered in the hotel’s restaurant while other amenities include a handy pub and lounge while 24-hour room service means you won’t go hungry or thirsty at the Bexley. Take advantage of affordable packages including up to 15 days parking facilities with night accommodation before embarking on a holiday to Paris from Ebbsfleet International Station. Holiday Inn London Bexley allows kids to stay and eat at no cost, which combined with its convenient location just 15 minutes from Ebbsfleet International Station provides an unbeatable opportunity for preparing a hassle-free trip. The argument for spending your holiday visit at the Bexley is that its location is ideal for anyone visiting London on business or vacation. For instance, the hotel is located in Bexley and handy for road travel to central London and the M25 motorway.In fact, many guests like to leave their vehicle in the hotel car park for easy travel by train or taxi to London sights. Moreover, there are many guests who say the Bexley is wonderfully located for local Tube travel via a 10-minute walk from the hotel lands you at the Bexley rail station for an easy train ride to such places as London Bridge and London Gatwick Airport. At the same time, the Bexley is very convenient for duffers who may enjoy a round at the nearby Birchwood Park Golf Centre. Also, for both daytime and evening entertainment, there’s the Dartford Borough Museum and the Orchard Theatre as well as the Bluewater Shopping Centre and the famed Eltham Palace. You can also visit nearby English Heritage venue Danson House in Danson Park. 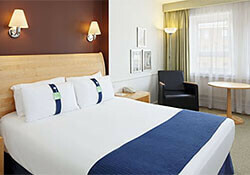 Overall, the Holiday Inn Bexley is a great choice for anyone visiting London. There are numerous testimonials featured online that prove this point, with former guests saying they highly recommend this very clean and friendly hotel. Keep up to date with the hotel’s news why not follow its Facebook, Google+ and Twitter profiles. Last updated by jack on 29 April, 2014 in Lodging.